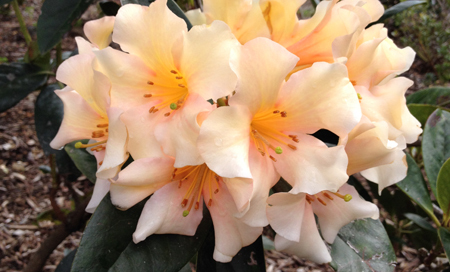 There are early, mid-season and late flowering Rhodos. The first to bloom during winter are Sir Robert Peel, Sir John Waterer, Mrs Henry Shillson and Christmas Cheer. These are followed by Cornubia, Red Admiral and Chevalier Felix du Sauvage. These early varieties can have their blooms damaged by rain or hail, but they do not suffer from petal blight. Petal blight is a fungus that can overnight reduce lovely flowers into a brown, pulpy mass. It can be controlled by spraying with a fungicide just before the flower buds open. Bayleton is the fungicide recommended. Once the weather warms up this fungus can appear quite suddenly.